Keeping it real & personal in this post simply because us girls need to stick together and survive during that time of the month. If you’re not ready for the girl chit chat, I suggest skipping to the next blog post and I won’t be offended 🙂 but since I got so many suggestions from you all regarding how to help control symptoms, I figured I would share! I recently experienced the most debilitating period cramps of my life. So much so that I felt nauseous from the pain and ended up getting sick/throwing up. After about two hours, the symptoms passed and I was able to get back to sleep for a few hours. 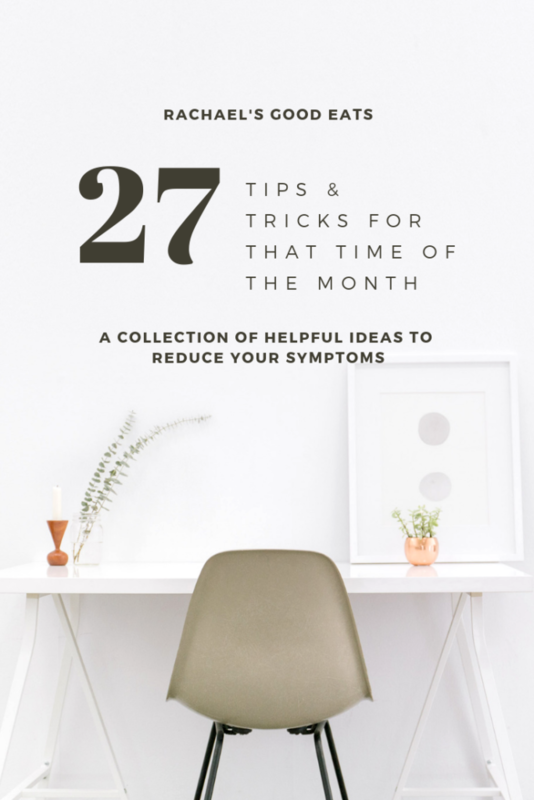 I shared on Instagram stories the following day (my favorite & best way to crowdsource valuable info, fyi) and some of you thought it could’ve been a ruptured ovarian cyst, some thought stress amplified my usual symptoms… whatever the cause may be, I will now hopefully be prepared if it were to happen again thanks to your helpful tips! – goji berry tea (Asian remedy): soak 2 tbsp goji berries in boiling hot water. No need to add sugar, they’re naturally sweet! If you do prefer a sweetener, a touch of honey works great– my favorite is Wedderspoonn Manuka honey. – “your tea” fertility tea: helps to regulate hormones, not just for fertility! – chocolate hormone balancing elixir: I made this during my most recent slew of negative symptoms and loved it! It felt so comforting and was filled with several great hormone-balancing ingredients. Get the recipe here. – clary sage essential oil massaged into lower abdomen: *SO many recommendations on this one!! – CBD salve (by Rosebud/Lauren’s All Purpose), CBD oil. I have this one and really like it! – vitex chasteberry: start taking 2 weeks before your period starts to lessen symptoms. I like this brand. – magnesium supplements: recommendation to take once a day, but two a day from ovulation (day 14) through when you start your period. This is a great brand! – ceylon cinnamon: incorporate in a warm, nightly tonic. try my hormone balancing elixir! – more strict with little to no added sugar to your diet before/during menstruation. Try my 7-day added sugar detox! – maca root supplement to help balance hormone levels. More info on maca here! – see an acupuncturist: acupuncture helps calm the nervous system and causes the blood vessels to dilate, increasing the flow of blood. Well-nourished ovaries function more efficiently. More info here! – more sleep! Take a nap if you need to. Your body is working harder during your period, so if its asking for rest, listen! – Oftentimes cramps are a result of blood clotting; blood not being able to pass through smoothly. Keeping your body warm can help to avoid, & in order to do that, try to refrain from cold beverages, smoothies, ice cream, etc. – Listen to your body! There’s something to be said about taking a break from exercise the first 1-2 days on your period, especially if you’re feeling a dip in your energy, are fatigued, feeling off-balance, etc. AMAZING!!! Thank you, and perfect timing, as I am starting early next week so thank you thank you thank you. I look forward to saving for my records. Additionally, wanted to add this article shares a lot of other food yoga poses that are more for relaxation and stretching and not strenuous at all 🙂 thanks again! I love this post, thank you so much! Is there anything other than Omega 3’s that you know help bloating?